At first boiled the milk until become enough thick. (Almost like half of 1½ liter milk). Then add the egg with milk and mix together finely, keep aside. And now heat the ghee in a sauce-pen, and then add the Lassa Semai with ghee and fry until become brown color. And then for making the caramel, mix together 3 table-spoon sugar and 1 table spoon water into a pudding maker pot or boll. Then add the semai on top of hot caramel. And then now add the egg-milk mixture with semai. And then keep the semai into woven for 40 minutes and heat it on 160 degree. Remove from woven allow sometime for cold and serve. 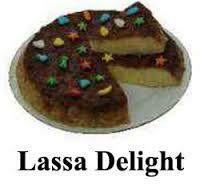 Finally serve this Lassa semai delight any decorated plate or bowl.